NEW CASTLE, PA, U.S.A., September 11, 2013: The first completely “cool-to-the-touch” heating system for injection barrels and melt pipes delivers heat more uniformly and reaches start-up targets more rapidly than band heaters, while substantially reducing energy consumption, it was announced today by Nordson XALOY, which will introduce the technology at K 2013 (Hall 11, Stand A26). Called SmartHeat™, the new barrel coating consists of two layers of plasma-sprayed metallized ceramic with a nichrome wire wrap sandwiched in between, plus a thermal insulation cover. Because the heat from the wires is conducted throughout the ceramic material, the system raises the temperature of the barrel to target levels more quickly than with band heaters, maintains it more uniformly, and uses less energy. 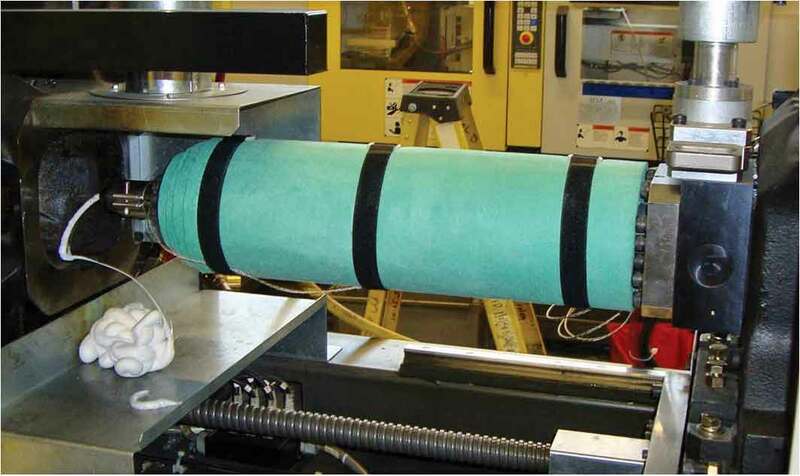 The tightly strapped thermal insulation wrap over the ceramic coating virtually eliminates heat losses to the workplace, saving on air conditioning costs and reducing the risk of operator injury. Another safety benefit of the new system is the elimination of the fire hazard from having numerous exposed wires connected to multiple heater bands. Instead, all SmartHeat wiring is run underneath the thermal insulation. The speed and uniformity of heating with the SmartHeat system appears in a side-by-side comparison with an injection press using conventional band heating, showing the effects on four zones. While the SmartHeat system brings the zones to the same target temperature within 15 minutes and then maintains all four at exactly that level, the start-up with the band heaters takes 23 minutes, and there continue to be wide temperature variations in each zone thereafter. Overall, the SmartHeat barrel coating is 30 to 60% more efficient than band heaters, according to David Hotchkiss, global product manager. The SmartHeat system can be used for process temperatures up to 750 ºF (400ºC). It is available with new barrels or can be readily retrofitted.